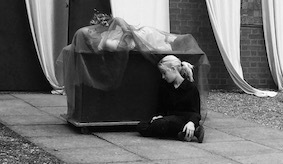 Performing Arts at Cransley is owned by our young actors. Our strength and innovation comes in our brave approach in facilitating and enabling the natural dramatic creativity of our pupils, and a resulting ownership, passion and remarkable talent in our few students that is tough to beat. We are determined to offer new genres and designs of performance, to provide new skills, new challenges, new experiences for both performer and audience. Our young actors are invigorated at the prospect of not letting our audience slump down in their seats and switch-off! 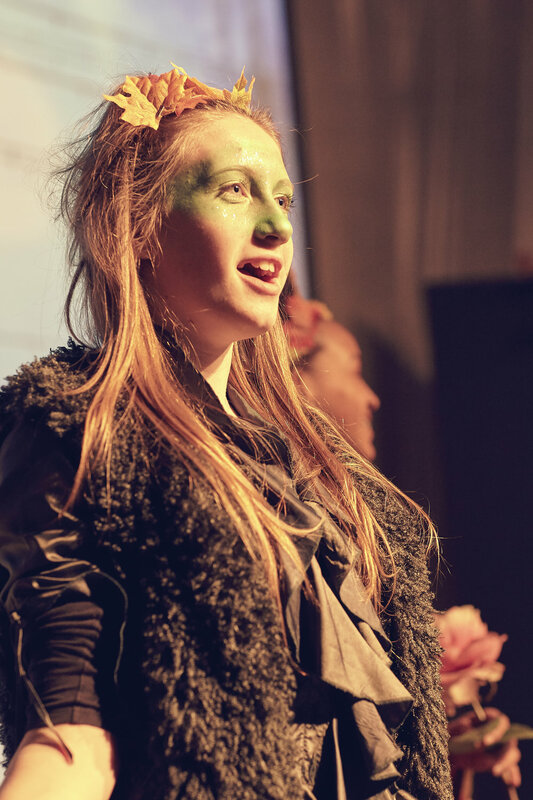 They are inspired and motivated to take part in theatre that is fit for the modern age, where their own ideas and interests lead performances, on a range of ‘stages’, which uses the technology of the day, and that results in performances from EYFS to GCSE that are relevant and fresh. Drama pervades the School and ventures beyond the proscenium stage. ‘Annie’ with her grubby orphan friends scrubbed floors in front of the common room’s 18th century fireplace; underhand car salesman ‘Mr Wormwood’ could be seen selling dodgy cars to the dismay of his daughter Matilda; the sickening ‘Twits’ lingered at the top of the red stairs, and Charles Dickens’ workhouse boys raised the roof in the canteen with their singing and dancing. The same Junior pupils have been back up on the main stage with a full-scale version of ‘Mary Poppins’ - where the confidence and passion of the children is now undeniable. Capturing the natural desire to role play and explore characters at this age, creates a natural energy and passion for performance that will last into the future. As our children move up through school, we push past the boundaries of what is expected from ‘school performances’, and challenge ourselves in our choices. What better way to teach children about performing arts than to empower them to perform and give them experience of a wealth of different genres? Our Year 7/8 recent adaptation of ‘A Midsummer Night’s Dream’ won its category in this year’s ISA Drama Awards, our second in as many years. A parent and recent audience member commented that he would usually rather spend time in his greenhouse, and dreads coming to sit for two hours watching children perform Shakespeare(!). Yet he was inspired enough to pass heartfelt comment, his face aglow, that watching our performance was “like we had worked out exactly what the audience would want to see, and combined this with exactly what the children would want to perform”, resulting in such an engaging performance that it had clearly transformed his views on theatre. Cransley has a passion for introducing Shakespeare to children at a young age. We have explored The Tempest in Year 4, Macbeth in Year 5 and Romeo and Juliet in Year 6. We believe this is the age when children are at their most receptive and open to the language of the Bard. That language must be spoken, played with, manipulated and enacted in order to be fully released into their consciousness. "While other children were focused on SAT exams, Cransley yr 6's were concentrating on producing the most amazing, inspiring performance of Romeo and Juliet. My daughter gained so so much from this and I honestly believe she will never forget it. Not everyone can be brilliant at everything but Cransley gives everyone the chance to shine. So lucky to be a part of this amazing school!" Our children are theatre makers, ‘let in’ to all aspects of creating performances, and therefore are learning broadly across all technical, design and production areas. ‘Belmont Haunt’’ has quickly become a highly anticipated annual event: a promenade multimedia performance with a strong horror-historical narrative, and certainly not for the faint-hearted. Our students soon learn the importance of collaboration as they master performance, technical and production skills, and handling an audience alongside experiencing the strong emotion and mood theatre can create. We are encouraging our children to be brave and resilient in what they choose to create and perform, and take leadership of it. Our GCSE girls chose again to devise a promenade theatre piece for their final showcase, rather than sitting the audience in straight rows in front of the stage. And why? Because they felt this would be more effective in creating a ‘curious’ experience for the audience, as the brief required. And also, because they felt empowered to do so. They understood that audience experience is paramount, that theatre makers cannot afford to ‘settle’ and play it safe. The audience’s travels were dotted with colourful characters, from Bellatrix (Harry Potter) to modern-day comedic Jack and Jill, Tweedle-Dum and Tweedle-Dee to Lucy Pevensie (Narnia), Lewis Carroll’s Jabberwocky slayer to a woodland fairy, popping up in different rooms, in corridors and on stairwells, and threaded together with a narrative that gave the audience’s a true journey. Whose imagination could fail to be captured by a performance so unique? Not to mention the modern dance, solo singing, film projection, atmospheric and ever-changing soundtrack, and the complete transformation of a Hall corridor to create a rabbit-hole-like tunnel of intrigue. It takes true courage and innovation to create such a unique performance, as was clear from the moderator’s reaction and comments about this ‘truly immersive top band performance’ (his words). The next performance on our list is an Academy Award themed Murder Mystery - a truly interactive immersive experience, and something completely new for actors and audience alike. As part of the evening, our own students’ short films will be shown: yet another way to engage students through a different medium, to inspire them to get involved in performing arts, and to help them realise that their contribution is valuable and worthy.